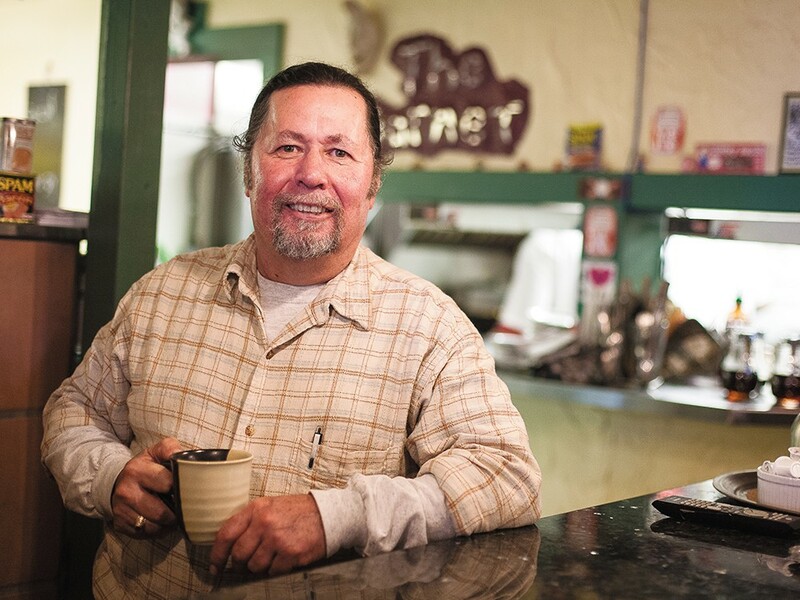 Everett Fees, owner of Garnet Cafe in Coeur d\'Alene, has cooked and owned a long list of Inland Northwest restaurants. Plenty of chefs start out busing tables, but who’d want to return to it? Chef Everett Fees, nodding toward the bustling kitchen inside Coeur d’Alene’s Garnet Café, has gladly done just that. That’s a relief to regulars who’ve flocked to the cozy 49-seat restaurant since 2010, when Viljo and Autumn Basso opened it as a breakfast-only neighbor to their Syringa Japanese Cafe & Sushi Bar. So even though Fees and partner Justin McLane took over Garnet in early spring, not much has changed. Same great service and menu combining low-key gourmet with a sense of humor. Housemade duck confit or rosemary bread served with a side of lemon curd, but also Spam and Eggs, or something called Green Eggs (pesto) and Ham. McLane owns Solar Stone, an alternative energy company, as well as McLane Farms in Cougar Gulch. They grow produce and raise two- and four-legged critters that may — if all goes as planned — end up on Garnet’s menu. Dinner service planned for late spring will be Sunday and Monday only with a farm-to-table format, highlighting McLane Farms and other local ingredients. That’s in keeping with the current menu, which lists featured ingredients like Bristol Bay salmon, Cougar Gold cheddar cheese, Nueske’s applewood-smoked bacon. In the meantime, Fees added Tuesday-Friday lunch specials like an open-face crab melt, deconstructed grilled chicken Caesar and tomato basil bisque with four-cheese grilled cheese. It’s the kind of kind of kicked-up comfort foods he favors, yet shows only a smidgen of his culinary range. There’s nary a local chef or restaurant with which Fees doesn’t have some sort of history. He was the executive chef at Patsy Clark’s and the Clark House and before that was a sous-chef in the early days of Beverly’s. He made casual fare at the Coeur d’Alene Casino golf course with Adam Hegsted, and — dipping into the memory vault — he worked at Soups, Etc. with 1970s-90s restaurateur Jim Duncan (Jimmy D’s, Wine Cellar). Pub grub? Fees was Kurt and Rob Widmer’s (Widmer Brothers Brewing) first corporate chef. He’s learned on the job, supplemented by classes, including with legendary chefs Jacques Pepin, Wolfgang Puck and Napa Valley’s Culinary Institutes of America. Fees has run his own catering business and owned Everetts on the Lake from 2000-04. Although it’s since changed hands many times, Fees’ turn at the Hayden Lake marina-based restaurant was, he thinks, the only one to make it year-round. Not bad for someone who fell into cooking while working construction in a place only slightly more accessible than the moon: the geographic South Pole. It was 1972 and Fees had joined his engineer father working at the National Science Foundation research station in Antarctica when the camp cook quit. Three years later, Fees returned home to California after a trip to discover he’d been robbed, his house vandalized. His father suggested Coeur d’Alene, where the elder Fees had worked during the Depression. The food industry can be rough, admits Fees, who says that although he loves being in the kitchen, he wants to take time to celebrate life. And mentor others. Fees reminisces about a kid from Patsy Clark’s he encouraged to go into cooking who now works at the prestigious Bellagio Las Vegas. When he talks about his grandson Nathan Evans who works in the kitchen, his eyes light up. “If you can have an impact on just one person,” he says, all the work is worth it.